Okay, so why would anyone think there is a "best" bike for a woman...it all depends on the woman, her riding style, her experience, and he height and strength. For overall agility, ease of learning, and quality for the money, though, it's hard to beat a Kawasaki Ninja 250. I've been riding for over 30 years, on everything from mini bikes to a Z1000, but the li'l Ninja is one of my favorites, even among my vintage 2-strokes! Speaking of which, it's quite empowering to build your own "dream" bike, which I've been doing for some time....it'll be finished, some day! Comments for No such bike exists! ...is so true! Yet it is fun, and more important?, a great learning experience, to hear what qualities we as women look for in a bike. Obviously, style! But are you into the street rod, sporty bike, the classic cruiser, the long-haul touring bike? How do you plan to use your bike; what are your riding skills; what do you aspire to in skill and type of ride; how far are you going; what can you afford? Eventually, I backed off (due to price tags mainly) and started looking at bike specs. I realized that although I know almost any woman who sets her mind to it can handle a large, heavy bike, we don't HAVE to. I settled on a Suzuki C50T, at half the body weight and half the cost (purchase price, insurance, maintenance - everything) of that Harley I dreamed of. I can still admire the Harley (there's one sitting right next to my Suzi that belongs to DH), and may someday decide it's what I want/need/deserve. But it won't be an "upgrade" so much as a change. I absolutely ADORE my Boulevard. Thanks for stating the obvious. Since when has anyone been able to invent one-size-fits-all anything? ?, especially for women?. I am a woman who rides and I've owned several bikes, all of which fit or didn't according to the time in my life and what I needed to get from my riding experience, not the bike itself. Thanks, Judy - I agree that there is no ONE best bike, but it sure is fun to see what others think. 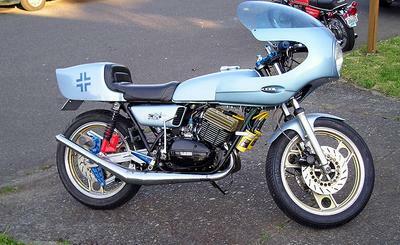 Your '74 Yamaha is cool!